Sensational story titles often intentionally mislead their readers in the hope of attacting more views. 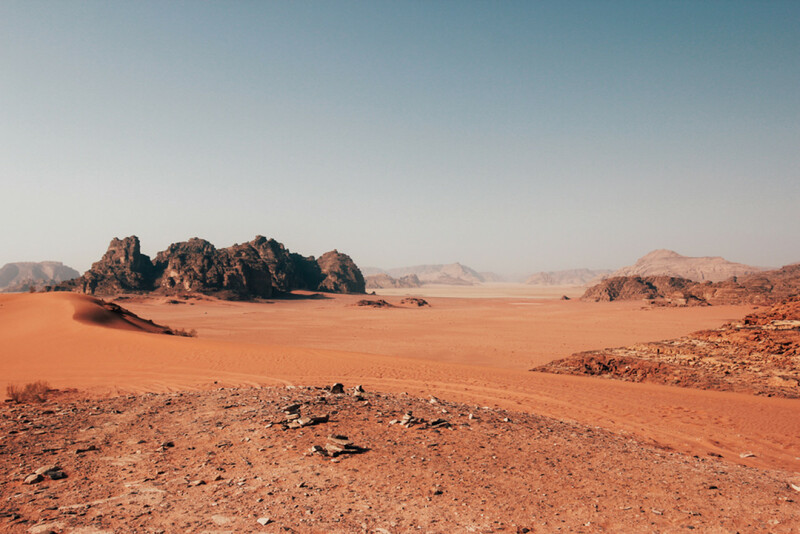 But spending time in Jordan’s Wadi Rum desert really does feel like an extraterrestrial experience - at least from what we've seen of Mars from the sci-fi blockbusters we all love to watch. Wadi Rum, also known as the Valley of the Moon, is the UNESCO World Heritage Site located in South Jordan that is becoming increasingly popular amongst travelers and filmmakers alike. The latter love using the area as a stand-in for the Martian landscape because it is uncannily similar to the red planet in its reddish and orange hues. The color explanation is less mysterious than it sounds. The arid landscape is composed of sandstone and gets its vibrant tones from various iron oxides that hold sand grains together to shape the rock formations. (I’m sure my geography teacher would be proud of me). Wadi Rum is becoming increasingly popular, but unlike Petra it didn’t feel touristy at all. Another thing you might find similar to Mars in Wadi Rum is the extreme heat. Especially during the summer months when the daily average temperatures can go far beyond 100 Fahrenheit (38 degrees celsius). But don’t worry, I’m no summer lover, and I survived even though I visited on a hot August day. One way to explore the desert is to go on a camel tour and slowly take the views in. A Bedouin outpost in Wadi Rum provides shelter from the summer heat. Wadi Rum is less than two hours south of the world famous Nabataean city of Petra, another UNESCO World Heritage site. After spending a night in Petra we reached Wadi Rum in the afternoon and had only a few hours left before sunset. We decided to use those hours to our advantage and take a 4WD tour with local Bedouins whose forbears have inhabited the desert for the past 25 centuries. Nowadays the area is home to about 5000 Bedouins who still maintain their semi-nomadic lifestyle. And we're off (Jiri on the right). When you say desert, people often think endless sand dunes. Wadi Rum is different - rugged and more scenic. Without our local guide, we’d be completely lost. We soon learned there’s no better way to explore the area than with the locals. Not only do they know every inch of this vast and mountainous 300-square-mile area, but they also know where the best spots are to watch the sunrise and sunset, as well as where to find shade and get a cup of tea or coffee. We found friendly company in a local Bedouin camp where we drank tea and coffee, and listened to stories from our local hosts. The last leg of our tour was overseen by this epic sunset. The highlight of the day came after the dusk when we finally reached our accommodation. On the northern border of Wadi Rum stands the spectacular Sun City Camp, equipped with 20 Martian-movie-inspired dome tents that tastefully blend in with the surrounding desert landscape. Here we could view the clear dark sky full of stars like nowhere else and had the most delicious Jordanian meal called zarb, a whole lamb cooked for several hours in an underground earth oven and served with a variety of meze (local selection of small plate dishes). We reached the Sun City Camp just a few moments before it got completely dark and checked in to our Martian tents. After we ate our delicious dinner, I couldn’t resist photographing the night sky and enjoying the moments of complete serenity in this unique place. Imagine waking up in the morning and the first thing you see is this view. Most of us at this point in human history can only dream of journeying to Mars. But traveling in South Jordan and staying in a Martian tent brings that out-of-this-world experience just that little bit closer to earth. Jiri is a destination marketer based in New York where he promotes the Czech Republic to U.S. and Canadian travelers. Between 2013 and 2015, he led a film tourism campaign called "Czech Republic - like a scene from a movie" introducting the Czech Republic as a world-class film tourism destination. Jiri also freelancers as a photographer and recently co-founded a specialty coffee company.